Forget about sleep, who needs sleep. And who actually can sleep when you know all those places you can go at night and have a great time, especially if you live in Croydon. Bars, pubs, restaurants and discos... okay, not discos. Nobody has that kind of time machine. Despite the bad apple of a name, this is actually the best nightclub in Croydon. Excellent music presented by DJs who nobody complains about, friendly staff, and plenty of theme nights so that you don’t have to guess when they’ll play your favourite music. Attention, British hipsters. You know who you are, the Victorian era lovers who just can’t let go of that Wuthering Heights first edition. The Spread Eagle Pub is waiting for you. This is a Victorian building made into a pub and supposedly into a theatre, but nobody can keep enough concentration to figure that part out. This pub is not only incredibly fun to say 50 times in a row, but also welcomes all guests and provides a great service. You can eat and drink and talk away the night with nary a worry. And it looks classical, so you can also try and talk up the bartender about your worries. If you want more music to your night, then you need to be on the edge, so to speak. Or just go to the eponymous pub. Live music awaits you there from dedicated local musicians, waiting for you to get tipsy so that you don’t immediately notice them slipping the notes. The best way to describe this cocktail bar is ‘shiny’. And the lights get even better when you’ve had a few. Make use of their different recipes to try out all those drinks that you wouldn’t touch when you are supposed to be responsible. 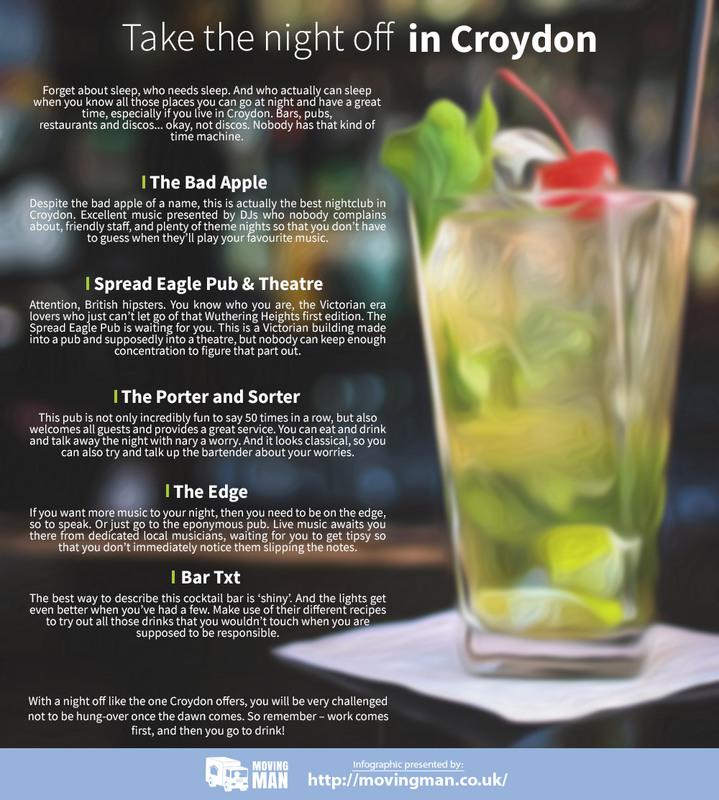 With a night off like the one Croydon offers, you will be very challenged not to be hung-over once the dawn comes. So remember – work comes first, and then you go to drink!